Enjoy the best shapewear benefits all-in-one shaper! This power body shaper slims your tummy, waistline, back, rear and thighs with our strong PowerSlim® fabric. The inner layer is a soft fabric that is easy to slide on and is comfortable throughout the day. Zippers are on the sides instead of the front to avoid irritating post-surgical incisions and show-through. Straps are wide and adjustable for your comfort. 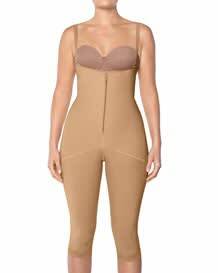 Wear this fabulous shaper for post-surgical recovery or to look slimmer in seconds.